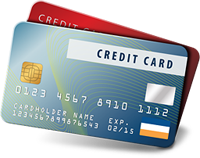 The Internet is now very secure for credit card use, far more so than for everyday use, where you hand your card over without thought to waiters and store clerks, and far safer than giving out your credit card number over the phone. E-commerce websites require a commitment to securing transactional details, including credit card information from customers. They use one of the many available encryption techniques which scramble the exchange of information between you and the website you are visiting so that it cannot be tampered with, corrupted or copied. Encryption is provided through a document the website provides called a certificate. Secure websites and pages will feature two important conditions that indicate they are using encryption technology and a Secure Socket Layer. This is indicated by "https" (letter "s" after the http portion of the URL), and means that the server is a secure one. In your browser, you will also see a lock icon in the Security Status bar. The Security Status bar is located on the right side of the Address bar. The certificate that is used to encrypt the connection also contains information about the identity of the website owner or organization. You can click the lock to view the identity of the website. Even if the connection between your computer and the website is secure, it does not guarantee that the website is trustworthy. Your privacy can still be compromised by the way the website uses or distributes your information, so you should read their Privacy Statement. While there is no absolute guarantee of safety on the web, you can minimize online privacy or security problems by using websites you know and trust. Try to use sites you've used previously or that are recommended by trusted friends or family. Always log out of websites by clicking "log out" on the site. It's not enough to simply close the browser window or type in another address. Mobile users demand high connectivity in today's world, often at the price of security. Requiring Internet access at the airport, public buildings, and restaurants, users will easily sacrifice a secure connection for a fast and reliable one. Many people like to work or study at coffee or book shops because they offer comfortable seating and free Wi-Fi, but be careful. There are risks. Use a VPN connection. A Virtual Private Network (VPN) work by encapsulating network traffic in an encrypted tunnel to a secure endpoint. Traffic is both encrypted and authenticated, rendering an attacker helpless to read or modify traffic. Require "https". Users should require all websites that send or receive personal information to use SSL. This includes your webmail. Many social media sites now offer SSL. Don't connect to unsecured wireless hotspots automatically; configure your computer not to automatically connect to a wireless network. This will prevent you from accidentally exposing private/confidential information because you might think you are on a secure network when in fact you are not. Run a firewall program on your laptop. Firewalls guard against attack from other computers also connected to the unsecured network. You wouldn’t want someone connecting to your computer and possible downloading information from your hard drive. Ensure that your computer has virus and malware protection. If you don't install one, your computer is sure to pick up a virus/malware soon. The more you know about how to make secure transactions when away from your home or office computer, the less likely it is you will encounter problems.